The �Shakespeare and the Stars� series celebrate the 400th anniversary of Shakespeare�s death and offer fresh and exciting insights into the ever-popular works of the world�s greatest playwright. Each analysis specifically highlights Shakespeare�s use of the archetypal language of astrological symbolism in both obvious and subtle ways. Such references would have been well known in Shakespeare�s time, but their deeper significance is lost to modern-day playgoers and readers. 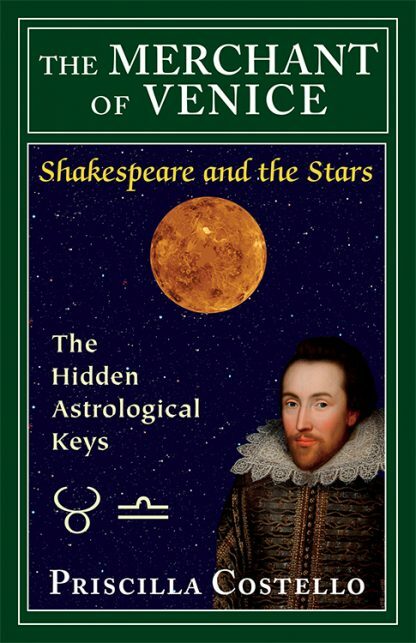 By keying each play to a specific zodiacal sign and its associated (or ruling) planet, Shakespeare alerted his audience to their significance in revealing character, foreshadowing the plot, and establishing key themes for each play. Each book ranges widely, incorporating related and relevant information from astrological tradition, classical and Renaissance philosophy, Greek and Roman mythology, esoteric wisdom, modern psychology (especially that of C. G. Jung), and great literature. Modern readers will find that each book will illuminate its play from a fresh perspective that deepens and profoundly transforms one�s understanding of these magnificent classics. Each book is 64 pages and is designed to be taken to performances or studied before and after reading and enjoying the play. The first three titles in the series are: The Merchant of Venice, King Lear, and A Midsummer Night�s Dream. The Merchant of Venice is attuned to both Taurus and Libra and their ruler Venus. Priscilla Costello, MA, Dipl. CAAE, is a teacher, writer, speaker, and counseling astrologer. An enthusiastic lover of Shakespeare�s work, she taught English language and literature for over 30 years. As a professional astrologer, she has the unique ability to synthesize Shakespeare�s literary and the astrological themes. Founder and Director of The New Alexandria, a center for religious, spiritual, and esoteric studies, she is the author of The Weiser Concise Guide to Practical Astrology (2008) and Shakespeare and the Stars series (2016). Listen to Priscilla Costello on the Weiser Books Radio Hour!